Thirteen top corps performed for the last time this season at the Division II & III World Championships this afternoon at Pasadena City College in California. The Spartans (96.150) were named the 2007 Division II World Champion and Memphis Sound (90.550) was named the Division III World Champion, both putting on the greatest performances of their seasons. "Today's show was great. The performance was very powerful and emotional and I couldn't have asked more from the corps members," said Peter LaFlamme, director of the Spartans. "I'm very proud of everyone who has been involved with our organization this year and I'm just thrilled right now. It's a little overwhelming, but very exciting to come out on top." Andre Feagin, the director of Memphis Sound was very excited to win today's Division III Championship and was very proud with everything the corps has accomplished. "The corps members were hungry to be great, and really, that's all I needed. You show me a group of young men and women who are willing to make a difference, and I'm going to make sure that that's possible," said Feagin. "I'm so proud right now that I don't know what to do with myself. The corps has over-achieved everything I could have possibly wanted for them." Jersey Surf (95.700) earned a close second in Division II, and Fever (90.450) missed the Division III championship by only one tenth of a point. Teal Sound (92.050) won the Division III bronze medal, finishing ahead of Blue Devils B (90.875) and the Vanguard Cadets (90.400), while Dutch Boy (84.425) won the bronze for Division III. The ninth and tenth place spots were awarded to the Raiders (84.400) and Revolution (84.225), as the Oregon Crusaders (80.775) and Impulse (78.850) finished out this year's top 12. 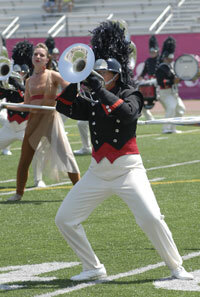 The Yokohama Scouts (88.625) also competed in the International Division and put on a very exciting performance. In addition to claiming the Division II championship title, the Spartans earned the best visual performance, best color guard and best general effect awards, while Jersey Surf took home the best brass performance and best percussion performance awards. The Division III champions, Memphis Sound, also won the best brass performance, best visual performance and best percussion performance awards, while Fever earned the best general effect and best color guard awards. The Spirit of Disney Award was given to Teal Sound for Division II and Dutch Boy for Division III. As these 13 corps close out their season today, the journey to the 2008 Drum Corps International World Championships will soon begin. But today's final performances and accomplishments will last with the corps forever.